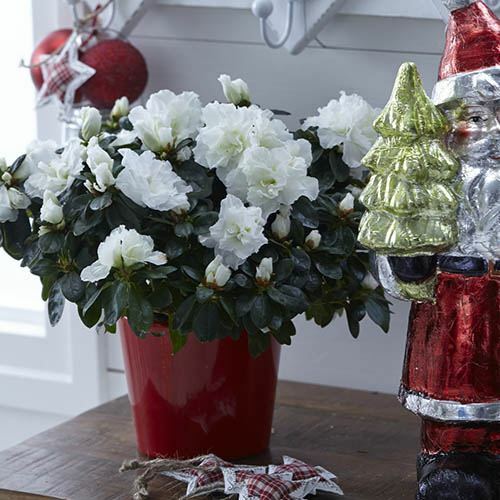 It's hard to beat the Classic White Azalea as a Christmas Houseplant Gift - it's gorgeous ruffled flowers often outlast those of softer houseplants, but the real bonus is - once Christmas is over it can be planted outside in a pot or the garden, and flower each Spring happily ever after! This makes Azaleas the perfect Christmas Plant Gift, as the lucky recipient will keep on remeberng your Gift for many years to come - what great value - and perfect for keen or less experienced gardeners too. The Azalea will come in a colour coordinated cachepot, so it can be unpacked and displayed straight away. If you are sending as a Gift, you can add a personal message at the checkout. Supplied as a potted plant, in flower and bud, protect from frost on receipt.